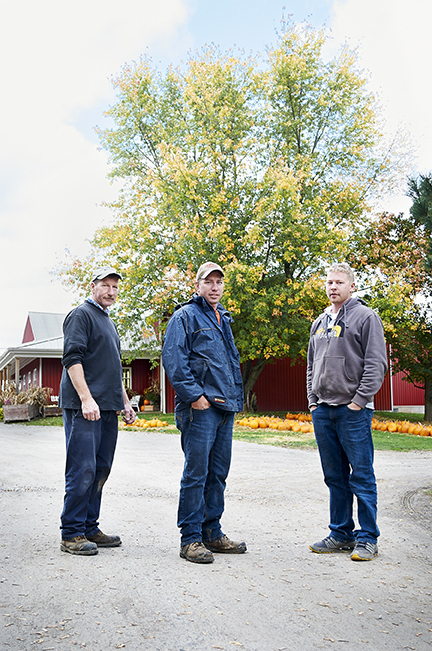 (Fenwick) – Thirty years ago, Leo DeVries, a full-time carpenter, and his wife Margaret bought a small fruit farm in Fenwick, Ontario – a move that fulfilled a lifelong dream of becoming a farmer. That farm consisted of two acres of pears, four acres of apple trees and acres of unworked land, which left room for expansion in the future. Soon after, Leo planted sour cherry, peach and apple trees. Because it takes a good seven years for cherry trees to fruit, he had time to transition from one career to the next. Eventually, he turned carpentry into a hobby and farming into a full time career. Today, the DeVrieses produce fruit and vegetables including apricots, nectarines, peaches, pears, plums, sweet and sour cherries, strawberries and some 20 varieties of apples. Most of the apple varieties they grow aren’t available in grocery stores. These include Aurora Golden Gala – a new variety that is a cross between a Golden Del and a Gala. Pinova, another new variety, is a cross from a Cox Pippen, and of limited supply. Nicola is a new sweet and hard variety that stores well during the winter so is sold in the spring. The family also grows and sells Honeycrisp, Royal Gala, Zestar, Ambrosia, Mutsu, Paulareds, Ginger Gold and Spys, a tarter apple that’s perfect for baking and many others. The DeVries family is one of ten cooperator farmer families to take part in a province-wide research project that involves the testing of new varieties. Kelly Ciceran, General Manager with Ontario Apple Growers, says the project, now in its fourth year, looks at a number of things, including how the apples perform under regional growing conditions. They are also tested for taste and evaluated for performance in storage, she says. The DeVrieses currently have seven new varieties planted on their farm. They plan to continue evaluating their performance in the years to come. For now, new varieties remain unnamed and are referred to only by number. Once deemed successful, apple breeders will then release varieties best suited for Ontario’s needs – both for consumers and producers. When he was new to the business of farming, Leo decided to sell his fruit wholesale. At the time, he liked the idea that wholesale prices were fixed, but knew that a move to direct sales would allow for more contact with customers. The DeVrieses no longer sell wholesale, choosing, instead, to sell direct at seven Ontario farmers’ markets – Hagersville, Niagara Falls, Pelham, Port Colborne, Woodstock, Brantford and St. Catharines. In 2010, they expanded yet again, adding a new retail store to better serve the needs of their customers. Two of Leo and Margaret’s five children still work on the family farm. After Dan graduated from college, he returned to the business, expanding the operation to include the farmers’ markets. Mark returned last year as well. Since their customers want fresh, local apples year round, the family had to find a way to store the produce during the winter months. Apples, explains Dan, produce ethylene gas naturally, which helps them to mature and soften – a quality that makes them difficult to store over the winter. To meet those demands, they use controlled atmosphere storage units, which keep the fruit at a temperature that inhibits ethylene gas production, and therefore, maturation. The units are opened in January, March and April-May. Once opened, the apples within must be sold in the six to eight weeks that follow. “What we love most about what we do is having a connection with the people that are buying our fruit,” says Dan. “And feeling like we’re contributing more to the community around us by supplying them with fresh, local food year round. This article, by Melanie Epp, is one in a series of profiles on Ontario farmers and farm businesses produced by Farm & Food Care Ontario. In the photo from left to right: Leo, Dan and Mark DeVries.